Brights Hardware was established back in 1971, by Mr and Mrs Luis. Brights started out as a general dealer specializing in electrical contracting and repairs. It has grown during the years into a store that supplies building material and hardware items. Brights Hardware first warehouse came into existence in Stikland Cape Town in 1995. In addition the outlet has expanded with the first franchisee store in Plattekloof in 2006 and our largest addition came into existence in Blackheath in 2009. Brights Hardware is now owned by the Luis children, their partners and Brights Hardware staff members who are shareholders. Since Brights Hardware came into existence in 1971 their challenge is to prolong the best service for their customers by considering our motto which is “Brights is more than just a hardware store”. In addition today this motto has not changed. For the next forty years Brights Hardware aims to make sure customers remain a top priority by offering them prompt service. Adhesives: There is a variety of adhesive items available such as crack fillers, tapes, glue and much more. Appliances: Refrigerators, vacuum dust bags, stove parts and more are sold at Brights Hardware stores at competitive prices. Electrical Appliances: Batteries, door bells, sensors and many more electrical items to choose from. 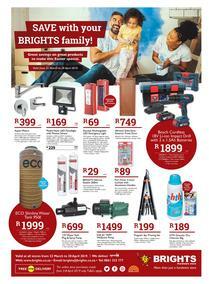 Lighting items: Desk lamps, globes, headlights, torches are available at Brights Hardware outlets. Tools: Customers can purchase screwdrivers, pliers, wood drill bits and more tools are in stock at Brights Hardware outlets. Bathroom Accessories: Toilet seats, shower curtains and many more are available in store. In addition other Brights Hardware products include stationery, general hardware, car accessories, plumbing items, power tools, paint, bedroom accessories, automotive items, audio and video items, bolt and nuts, building accessories, pool accessories, brush ware products, garden and irrigation accessories, general hardware items, airtime and many more. Brights Hardware can now be found on Guzzle. Guzzle is the ideal platform for viewing Brights Hardware specials. 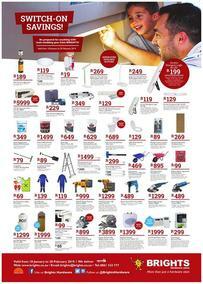 Moreover Brights Hardware specials are offered during certain times of the year via Brights Hardware catalogues. The prices are competitive, so you should start browsing through Guzzle now!! !